The thing that never ceases to amaze me is the grandeur of Russian conferences, and well, many post-soviet for that matter as well. The organizers of the conference always try to impress the participants by the venue, food and entertainment. That is why, I think fellow colleagues envy each other, once the opportunity to go to the conference comes along. 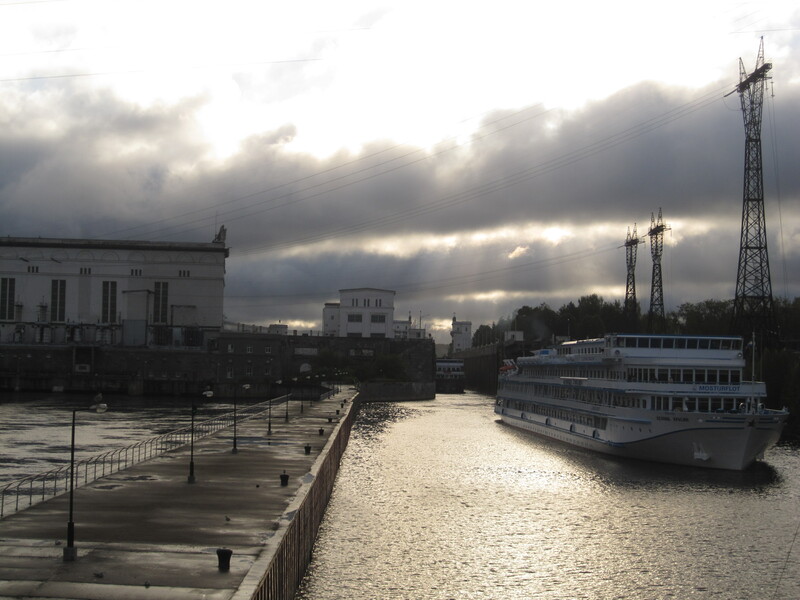 Today I am on a boat that is headed from Saint Petersburg to Ladoga and Onega lakes and the reason I am on this boat is the conference. At first I was taken aback when the organizers of the conference informed me about the venues – privat bar, disco bar, panoramic bar – what kind of the conference is this? Well, since this is a cruise ship, I guess the names make sense. Ladoga and Onega lakes are large navigable lakes in the north-west of Russia. Onega – 2nd largest lake in Europe after Ladoga. The lake is fed by about 50 rivers. There are about 1650 islands on the lake. Needless to say it was a pretty cool venue for the conference. There is not a single conference on boat, to be exact, but a whole international forum. The focus of the forum is the modern information society, its problems, perspectives and innovation approaches. The forum lasts 5 days and is broken into 5 session. The session I participate in is called “UNESCO chairs partnership on ICT in education”. The ICT in education really intrigues me, I love the so called “teacheology”, online platforms for learning and apps for structuring of the course. I use zendock, weebly, courser, open culture, google apps, create forums for my students, hold webinars when I can’t leave the house for some reason. UNESCO puts a lot of emphasis on accessibility of education and this is where ICT technology can be of great help. When I applied for the conference/session, I thought it would be a practical event where I would be able to see and learn new educational technology, use of ICT in education and so forth, but this turned out to be more of a policy design session and a discussion of broader approaches and curriculum design aspects. It is, of course, extremely interesting and I feel as if I were a student again writing everything down furiously, highlighting catchy phrases like “provide a context”, “project based active learning”, “corporate university” and so on, sketching concept maps “curriculum as a product => bad, curriculum as a process => good” and taking in statistics of universities that work in the sphere of virtual learning. This is all very exciting, and most of participants here are either directors of ICT centers, vice-rectors responsible for informatisation, deans and chairs of ICT departments. As I look at these people, these policy makers, whose decisions impact hundreds of faculty members and even more students, I think whether they are visionaries or just bureaucrats. Some of them talk about the power that education has to trabsform, emancipate and empower an individual to change the world, while others devote their presentation to statistics and student/teacher ratio. Another thing that really stands out is how different the approaches to the problem are in Russia and European countries. While Russians have a tendency to use these conferences for self-promotion, emphasizing their input in the field, European speakers at this conference talk about trends, global issues and challenge the audience to ask new questions. So it seems as if for Russian participants this is an event to show off or to report on how awesome they are, and Europeans look for new interpretations, new ideas and new approaches to problems. My question is then, where is the innovational driving force located? It seems to me that Russia is again limping long while UNESCO and UN set the goal further and further into the future. But not to be overly too critical, it is very important to consider serious road blocks for my Russian colleagues: the money, the workload and the fight for survival. OK, the latter two stem from the first one. As long as a university professor has an average salary of 500 USD, with an average of 900 lectures a year (not including time devoted to planning, assessment and consultation of students) we can’t expect overly innovative and active teachers eager to implement new technology and take training courses. It will be easier to just go your old way, use old books, that you are used to and just generally stay “in the swamp”. But not to sound too pessimistic this time, there are mechanisms (including financial stimulus) that are working in some institutions of higher education in Russia, so not all is lost. A year ago, an European curriculum guide for a joint international master programs in ICT was designed in Germany. This guide was used for the development of a similar program adapted to Russian standards. It seems like this is a very comprehensive and actually an innovative curriculum (not without shortcomings imho) that will be used in joint MS programs in our countries. Another thing that I am looking forward to is the development of educational networks that facilitate communication among universities. I always complain how hard it is to get in touch with colleagues from other regions of Russia – it is a huge country after all – and that we often have no idea what is happening in our fields of work, that leads to закрытость в себе. Hopefully, the clever management of these network systems will make outreach and collaboration easier. I’ve seen it work at the state alumni websites, where all graduates of various US State programs come together, start joint projects and get funding for their work. If something remotely similar can be established between Russian universities, the future of Russian education will be bright.